Pseudechis colletti is one of Australia’s most beautiful elapids, this has made it one of the most commonly kept species of venomous snake in Australia both in public (zoos etc) and privately owned collections. 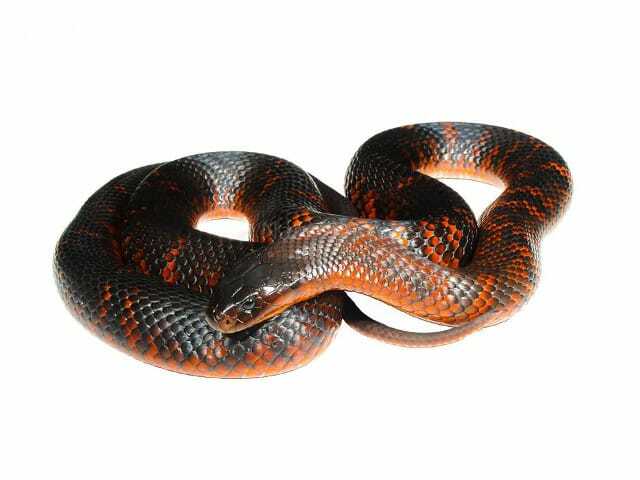 The adult colouration of Pseudechis colletti may vary between a dark tan to almost black above with irregular cross bands. The colour of the cross bands may vary between cream to orange-red. Juveniles have the same colouration as the adults but are brighter and far more contrasting however this fades with age. I would recommend a lockable cage of the following dimensions: 1.2 meters long by 0.6 meters deep by 0.7 meters high (3.9 x 2 x 2.3 feet) to house a pair of adults. There has been known cases of cannibalism in this species so it is recommended to house them individually except during breeding season if you are planning to breed them. Cage decorations might be used like a rough rock for shedding upon. A hide should be placed about 0.2 meters (0.6 feet) from the light-bulb box so the reptile has a ”hot spot”. You should also have a hide on the cool end so that the snake can thermo-regulate and feel safe. The substrate used could be gravel or paper; gravel looks better than paper but is harder to generally keep clean than paper. I recommend paper, as it is easier to keep clean thus reducing the risk of disease. Cages should have a thermal gradient being 30-32 °C (86-90 °F) at the warm end of the cage and about 20-24 °C (68-75 °F) at the cool end. A pair of “blue globes”(40 watt maximum) at the warm end of the cage will produce the desired amount of heat, the globe must be hooked up to a thermostat to regulate the temperature inside the cage. Other heating systems can be used such as heat cord and flexible heat tape. These systems must be used in conjunction with a controller to regulate temperature. A heat gradient must be maintained to allow for adequate thermoregulation. Note the globes should be inside a box so the snake cannot burn itself. Pseudechis colletti doesn’t require high humidity. A humidity level of 40-50% is recommended. Of course during shedding period the humidity levels can go up to 60-70%. In the wild this species eats frogs (Crinia sp, Limnodynastes sp and Litoria sp.) and the plague rat (Rattus sp). In captivity, they readily eat mice and rats, but juveniles may initially need to be feed on elvers and then eventually weaned on to pinky or fuzzy mice. Juveniles can be fed weekly and adults once every 14 days. Handling should be kept to a minimum as it’s a venomous species. Just like with any venomous snake, great caution should be taken when handling this species. Handling should only be done with the use of hooks and other tools made specifically for the safe handling of venomous snakes. Spot cleaning of the enclosure whenever is necessary. Make sure that the water is always clean. Whenever is needed I change the whole substrate and clean the enclosure.